New case study shows how Dunham School enriches education with community service managed by x2VOL. Dunham School (Baton Rouge, La.) 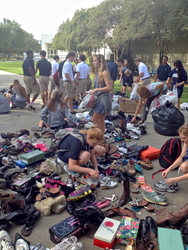 students sort over 500 pairs of shoes which were sent to Haiti and other Baton Rouge charities including Hope House supporting women escaping human trafficking. What I like about x2VOL is that I can post a new project, with all the information—day and time—and easily e-mail it to all students. Dunham School is teaching a lot more than the core curriculum to their students. Dunham School students give a minimum of 100 hours in community service before they graduate which enriches the students’ lives and helps others in need. Dunham’s service program and how they manage it with x2VOL from intelliVOL is chronicled in a newly released case study available now. Click to Tweet. Dunham is a preK-12 Christian school in Baton Rouge, La. While service is required, many students give more than 100 hours. The school also asks students to reflect upon on their service which helps them to think beyond themselves, rounding out their education beyond classroom instruction. x2VOL has greatly simplified the community service program at Dunham including the students’ reflections. x2VOL makes hours submission, management, reflection and verification a turn-key process. Administrators and students can easily generate reports as needed for scholarship and college applications. Students can use an online or mobile app for recording and managing their hours.